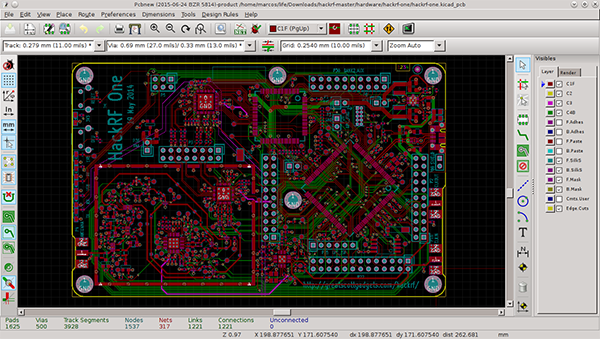 KiCad is a free software suite for electronic design automation. It facilitates the design of schematics for electronic circuits and their conversion to PCB designs. KiCad was originally developed by Jean-Pierre Charras. It features an integrated environment for schematic capture and PCB layout design. Tools exist within the package to create a bill of materials, artwork, Gerber files, and 3D views of the PCB and its components. Altium Limited is an American, Australian-domiciled owned public software company that provides PC-based electronics design software for engineers who design printed circuit boards. Founded as Protel Systems Pty Ltd in Tasmania, Australia in 1985, Altium now has regional headquarters in the United States, Australia, China, Europe, and Japan, with resellers in all other major markets. EAGLE is a scriptable electronic design automation application with schematic capture, printed circuit board layout, auto-router and computer-aided manufacturing features. EAGLE stands for Easily Applicable Graphical Layout Editor and is developed by CadSoft Computer GmbH. The company was acquired by Autodesk Inc. in 2016.